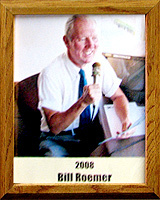 Bill Roemer is a well-known and respected sports announcer and broadcaster known to Tucsonans for more than 30 years. He has served as public address announcer at Tucson Toros and Tucson Sidewinders minor-league games since 1984 and spring training games for the Cleveland Indians, Colorado Rockies, Chicago White Sox and Arizona Diamondbacks since 1978. Bill also has been the announcer at Tucson Greyhound Park since 1987. Bill also has extensive experience as a member of the media. He has worked as a stringer for United Press International covering University of Arizona sports, boxing, spring training and golf. He served as assistant news director and sports director (1989-93) for KKLD-FM and KJYK-AM, a play-by-play man and talk show host (1984-88) at KTUC-AM, assistant sports director (1982-84) at KOLD-TV, sports director and news reporter (1978-81) at KZAZ-TV doing nightly and weekday newscasts covering UA, Toros, Tucson Sky volleyball; sports director (1975-78) at KOLD-TV, producing live news and sports reports and weeknight newscasts as well as being play-by-play announcer at KMSB-TV for UA basketball and baseball. A graduate and former athlete at the University of Notre Dame, Bill served two terms as president of the Tucson Press Box Association. He also has coached and officiated in Little League and youth-league basketball.